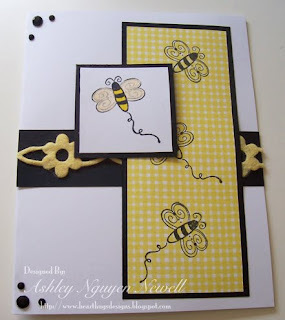 I am just in love with this yellow, black and white color combination right now. I can't seem to go a week without using it. Maybe it's because we watch Bee Movie everyday! :) Probably. So, thank you Brady! This card is for the Limelight sketch and product challenge. The product we were supposed to use is paint. I used Shimmerz Blings in gold on the wings of the bee. I always give wings some sort of treatment since I think they should be translucent and magical looking. The stamp is from Unity's June 09 KOTM. I have no idea what the DP is. The ribbon is from the $1 bin at Michael's. And the bling is Kaiser Craft. I hope you all have a wonderful Sunday! PS If you live near a Jamba Juice, today is the last day for THIS buy one get one free coupon. Enjoy! Fabulous card and just love those colors together. Just enough bling bling on this card. Thanks for all the inspiration you give me everyday. I wish I lived by a Jamba Juice, yum! Lovely my dear! Love those buzzin lil bees!